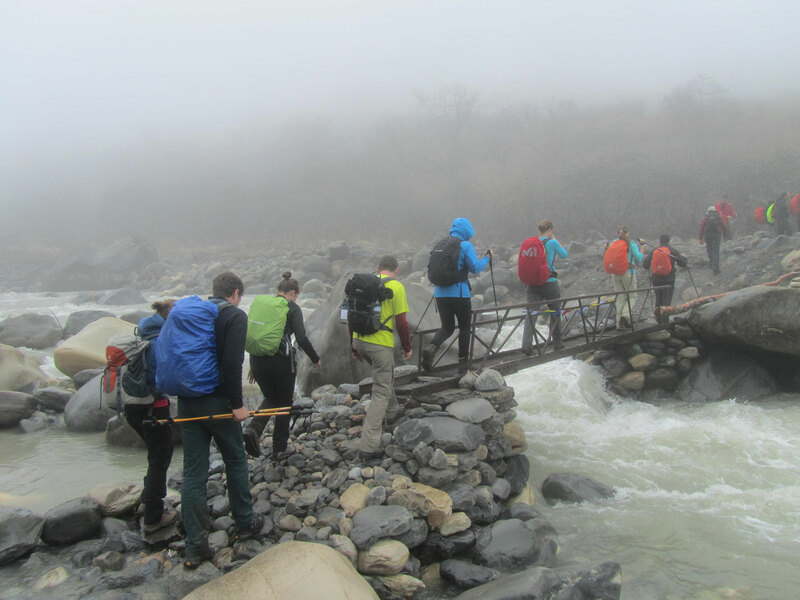 Kathmandu Valley Trek is a beautiful trekking route around the Kathmandu valley. We explore almost tourist destinations near Kathmandu. This trekking is suitable for travelers who have a limited holiday as well as suitable for all age groups. We start our journey from Sundarijal, Chisapani, Nagarkot, Dhulikhel, and Balthali; in route, we visit the Namo-Buddha and Panauti. Besides the beautiful trekking on this route we also get a chance to observe the typical cultural and historical environment. Panauti and Namo-Buddha rich in their own traditional historical and cultural value. While on the trekking we get chance to see beautiful mountain views that include: Mt. Manaslu 8163m, Mt. Langtang Lirung 7246m, Mt. Ganesh Himal 7604m, Mt. Dorje Lakpa 6988m, Mt. Gauri Shankar 7145m & Tibetan Himalayan range. Arrival and pick up from the international airport in Kathmandu, after some refreshment we will invite you for a traditional Nepali dinner o/n in a hotel. After breakfast, sightseeing visit, in Kathmandu valley including, Kathmandu Darbar square, Swayambhunath temple, Boudhanath Stupa & Pashupatinath temple. Drive from Kathmandu to Sundarijal, the trail climbs up through mixed forest and passes the Mulkharka village to Chisapani Danda, in a clear day there are good views of the mountain from east to west. There is a good view of the mountain and Kathmandu Valley. An interesting trail takes us to the hill retreat of Nagarkot, perched on a ridge 32 km east of Kathmandu, Nagarkot is also a popular spot to watch sunrise and sunset. The trail climbs up to the tower of Nagarkot, from the tower there are excellent views of mountain including the view of Mt Everest and Kathmandu valley, Trail descends through rhododendron forest and villages to Dhulikhel, in a clear day there is an excellent view of eastern Himalaya. This day after breakfast trek down to the Balthali. Today we walk about three hours and reach the enchanting Balthali village offering excellent mountain views. The morning after breakfast, we trek about 2 hrs to Panauti crossing through a rice field, village and sightseeing around in Panauti, Panauti is a historical city in Nepal. It is a small city. It is a junction of Roshi Khola and Pungamati Khola, there is a saying that, the entire town is a built on a single piece of solid stone, making it protected from the earthquake. Panauti was once a junction of an important trading route, but today, it is just a quiet backwater retained and restored its architecture and has a number of interesting temples and out of that we can also find the one of the oldest temples in Nepal, from here we further drive to Bhaktapur. Bhaktapur is the ancient town in the east corner of the Kathmandu Valley. It is the third largest city in Kathmandu valley and was once the capital of Nepal during the great Malla Kingdom until the second half of the 15th century. Bhaktapur is listed as a World Heritage by UNESCO for its rich culture, temples, and wood, metal and stone artwork. Principalities of valley, you will visit old royal palaces, temples, stupas, and monasteries and where we will see lots of striking intricate wood and stone works. This ancient city of Patan is known as Lalitpur, cites the arts, 5 km south of Kathmandu. The city is full of Hindu temples and Buddhist monuments. And further, we visit Bungamati and Khokana which is famous for Newar culture and values. Jagat is the best person to organize any trip. Without him, I could never be had seen all the things I did or gone to all the places to. My trip started at Kathmandu and had the car to Sundarijal then we trekked to Chisapani stayed for 1 night then trek to Nagarkot then Dhulikhel for 1 night then trek to Namobuddha left there after 1 night on to Balthali. Then on to Painauti. After this back to Kathmandu. Just an amazing trip. I recommend this to anyone that wants to see places in Nepal. We were for 17 days in Nepal and we spend those time very well. Starting from sightseeing for Kathmandu valley to the higher places around Kathmandu to the Jungle in Chitwan right to the border of India to the cozy Nagarkot where sometimes when it gets dark it seems like clouds come into the mountains. One of the finest experience where also a mix of cultures a and religion. The world has to see to Nepal how to live together like that. And yeah we saw them all: Hindouistic, Buddhistic, Muslim and even Christians in a little house bar with the bed behind. We saw it cause there were pictures of Jezes everywhere. The biggest moment was to be in Namobudda> We slept in a Buddhistic monastery where we did also 3 prayings and eat zenith the monks. All this wasn’t possible if there was not the great organization of the whole Himalayan Leaders team> The service was Perfecto and special thank to our Guide Padam with the interesting history and religion lessons on our journey around Nepal. Also, thanks to Vinod for his save rinding and everytime a helpful hand for the luggage. Thanks and see you next time Himalayan Leaders!!!! !